Jewson are the UK’s leading chain of builders merchants with over 600 branches across the UK. 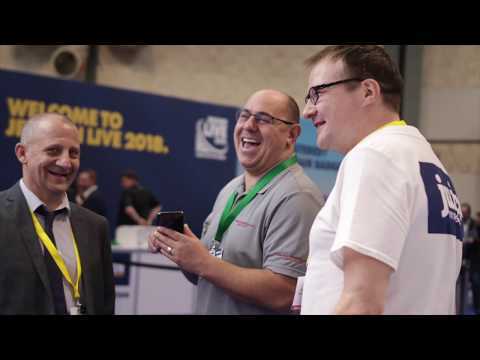 Their annual Jewson Live exhibition is the UK’s biggest builders merchant show taking place at the NEC in Birmingham. We worked with their team again to deliver an exhibition stand to promote their Juice Rewards programme. Juice is a points based scheme that rewards Jewson customers with every purchase. Located right at the hall entrance this was the first stand that visitors saw so it was important that it stood out and attracted their attention. The guys at Jewson wanted a fun way to get visitors to sign up and win points to add to their reward accounts. ‘Balls’ we thought! So that’s exactly what we added. Visitors could win prizes and points by throwing sponge balls through various holes in the wall. IN FOR THE WIN worked a treat. We again designed the stand without a raised floor. This year we extended the aisle carpet in to the space so visitors were drawn directly in to the stand to talk to staff. We also positioned iPad’s around the stand where visitors could sign up to Jewson Juice and redeem their vouchers.